Anger are Julian Angerer and Nora Pider, both originally from Brixen, South Tyrol. The dream pop duo moved to Vienna and brought a beautifully melancholic mood with them, accented with a soft Italian flair. Anger describe their story in just a few, but strong words: “Emo-Boy meets cool skater girl. They don’t like each other, of course. Eventually they become friends, then a couple. 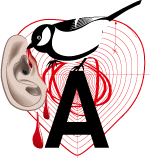 And then a band.” And so Anger´s first EP – aptly entitled “Liebe&Wut” (Love&Anger) – was released in September 2018, followed by the singles „(Find) Someone“ and “Love”. Their debut album as well as a couple of festival shows, including Sonar Festival, are announced for 2019.